It’s a word that is heard all too often by way too many people. It is very rare to find anyone who has not been touched in some way by cancer, myself included. To raise the money to beat the monster that is cancer there are walks and runs of all shapes and sizes all over Canada and the world. 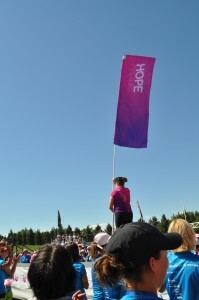 I’ve donated to several of them in the hopes that one day a cure will be found, this past weekend July 24-25 I walked in my second Weekend to end Women’s Cancers. The two-day event has participants walking throughout the city streets and park paths in the name of cancer research for women’s cancers. 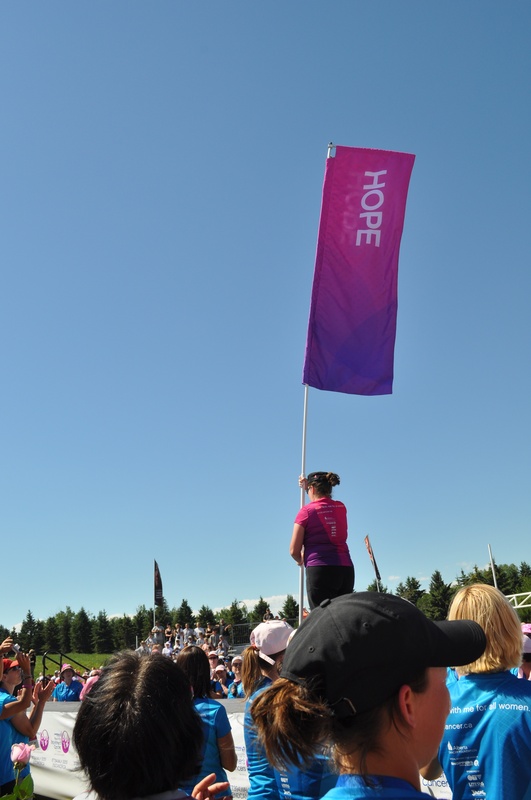 In Calgary alone this year 2.7 million dollars was raised for the Alberta Cancer Foundation, in the past money raised has gone to fund a mobile mammogram unit that can travel to rural places where mammograms weren’t offered in the before. Money raised this year goes towards to two new chairs for women’s cancers, one breast, one ovarian in Calgary and Edmonton. So on July 24, my Simply Brawesome teammates, Lesley, Vicki and Des and 1110 other walkers set out. People walk everyday, piece of cake you might say. Well, it is…for the first ten kilometres or so. Then your feet start to ache a bit, you might get a blister or two and your body starts to give you hell for walking with little rest. Not that rest isn’t offered of course, every two to four kilometres there would be rest stops with fresh water and Powerade, snacks and medical supplies. I’m 27, in pretty good shape and try to workout every now and then, so whenever I felt like complaining or wanted to sit down and have a nap I just thought about the reasons I had for walking in the first place. I had personal reasons but it was also the women walking around me, some with cancer, some that had beaten cancer, some that were three or four times my age, some walking with canes… and it gave me the oomph to keep walking. Having my teammates around helped as well, although on a walk like this, everyone is a teammate. It’s not just the nurses and EMT pedalling beside you that ask if you’re alright, it’s the women (and men) walking around you that are also checking on your well-being all along the way. Finishing 32 kilometres on day one felt exhausting but the camp set up at the Currie Barracks provided a great dinner and some Wild Rose beer. A medical station was on hand to treat my lovely blisters and tents were set up by the fabulous volunteers. When you wake up for day two, you wonder how it is even possible to walk another 28 kilometres when your muscles ache and your feet are crying for reprieve. It’s The Little Engine That Could frame of mind really, in your head you’re thinking, “I think I can, I think I can,” over and over. The fabulous people along the way, both in the pit stops as well as homes that provide water, cool sponges, watermelon and freezies urging you on with cheers and sidewalk chalk messages also give you that boost. And in the end, while you know cancer will still show it’s ugly face around the world, you’ve done something to eventually give that ugly face the boot.